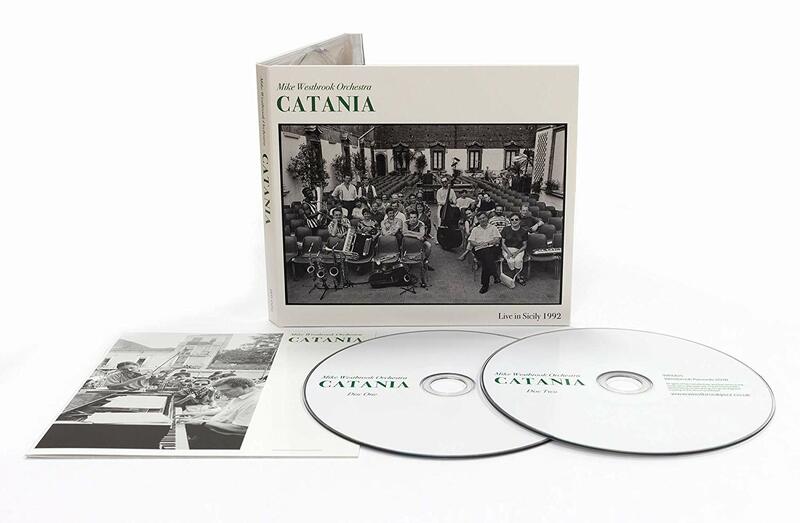 This previously unreleased double CD takes us back to a series of Mike Westbrook Orchestra live dates in Catania, Sicily in July 1992. The unrestrained, joyous and powerful performances seem to bring with them the smell of the Mediterranean outdoors on a balmy evening: sometimes languid, sometimes heady, and memorably enjoyable. Composer and pianist Mike Westbrook reminds us in the extensive sleeve notes that while these days no concert seems to go unrecorded (if only on someone’s phone), back then all they came away with was an inevitably unbalanced ‘desk mix’. However, other recordings of the events have recently emerged (including a cassette from an audience member) and have been combined by the much-missed Jon Hiseman with Jay Auborn and Callum Godfroy into a compelling record of work from three nights of performance. It’s a tribute to Hiseman that the joins are pretty much inaudible, leaving us clear to focus on the music. And what music it is! The opening music is worth the price of admission; View From The Drawbridge from Westbrook’s Citadel/315, originally written in 1974 as a feature for John Surman, is put into the hands of a relatively young whippersnapper called Alan Barnes on alto sax. Those accustomed to hearing Barnes’ neat and polished mainstream output these days would be well advised to take a listen to the extended workout here, beautifully rendered from an exploratory opening into confident and passionate music-making with a reflective ending, never descending into mere pyrotechnics. The thematic statement at the start of the piece is dramatic, the brass particularly well captured with Barnes prominent again (this time on clarinet). In the background a baby cries out, bringing us back to the place and the people. A sonic knock-out. Except that this is only the first round. Again and again we get up for the next instalment. Love And Understanding, also from Citadel, sees a rocky beat with building brass backing riffs building for Alan Wakeman (tenor sax), Paul Nieman (trombone), Peter Whyman (soprano sax) and James McMillan(trumpet) to stretch out. In this kind of jazz the solos are never knowingly under-developed, but these players are well up to the challenge in keeping things inventive as the band gathers momentum behind them. Other highlights on disc one include an outstanding vocal performance from Phil Minton on the ballad Song Of The Rain from Mama Chicago, with Anthony Kerr’s vibes shimmering in response. Kate Westbrook takes the vocal lead on Leñador with Frank Schaefer’s cello in support, leading into an extended piano solo from the late Pete Saberton. The disc closes with a terrific run at Factotum al Bebop, inspired by Largo al Factotum from Rossini’s Barber Of Seville and introduced by Westbrook in Italian. This is old-school swinging jazz of the highest order, the horns sizzling before Alan Barnes takes another exuberant turn at the front. The second disc takes us on a tour of Westbrook’s influences and fascinations. William Blake materialises with I See Thy Form, sung by Phil Minton with a suitably revolutionary also sax solo from Chris Biscoe, backed by a majestic brass arrangement, and Long John Brown which gives Minton a chance to show his considerable power to full advantage. Duke Ellington joins the party: I.D.M.A.T being a deconstruction of It Don’t Mean A Thing giving more space to Whyman on soprano, which is followed by Billy Strayhorn’s Lush Life, Biscoe to the fore, with a Westbrook family vocal/piano duo. Brecht and Weill appear towards the end of the recording, with Surabaya Johnny (Kate Westbrook and Alan Wakeman solo). Alabamasong gyrates with off-beam harmonies. This memorable set ends with The Toper’s Rant, a ‘paean to good ale and good fellowship’ by Westbrook and John Clare, with three alto saxophones jousting with the violin of Dominique Pifarely before the band disperses into the crowd amidst confusion and applause. This double CD is like a window into another world; the time of terrorist attacks in Italy which threatened the show, the openness of Catania which offered Westbrook the chance to put on three performances of whatever he liked with whoever he wished and then offered it as a gift to the citizens with free admission (all documented in the excellent 12 page CD booklet). The atmosphere hangs lustily, the music triumphs, the dust settles again. The wonderful news is that these evenings live again. Sadly, not everyone involved with producing the music is still among us; along with Pete Saberton and editor Jon Hiseman, trumpeter Dave Plews and sound engineer Debbie Dickinson are gone. Except, of course that they live on through their work. This CD is a celebration – buy it and listen to it in that spirit.